We have thematically summarized frequently asked questions for you. If we can answer detailed questions, please call our support service. Can I order VALLONE® product samples? In order to give you a first impression of our mineral casting VELVET STONE™ , we are happy to send you a free material sample. Please feel free to contact us via info@vallone.de or fill out this form. What exactly is VELVET STONE™ by VALLONE®? VELVET STONE™ is a high quality mineral casting material, which is made from natural minerals such as quartz gravel, quartz sand and stone powder and a small proportion of resin to bond. It is extremely durable and unbreakable compared to ceramic. The appearance and feel of this noble, warm and velvety composite is comparable with high quality natural stone such as marble. The durable and easily recyclable material offers a smooth surface on which bacteria and dirt can hardly be deposited. What is the insulating value of Velvet Stone™? Thanks to a low thermal conductivity and high thermal capacity, the insulation properties of VELVET STONE™ are excellent. How accurate are the sizes given in the technical drawings? Our high quality VALLONE® products are handmade for you. Therefore, there may be very small size variations in the manufacturing of our products. The information in the technical drawings are of average values, which may slightly differ (millimeters). What is difference between matt and glossy surface? We offer almost all products with a matt or glossy finish, to suit your individual preferences. The frosted (polished) surface looks especially exquisite, small damages may be easily repaired with sandpaper. The high quality appearance is suitable especially for modern projects. The glossy surface can be described as classic. It fits perfectly with ceramic objects, which also have shiny surfaces. Shiny surfaces are frequently chosen by customers who plan to expand an already existing bathroom space. Convince yourself and request a free sample. Make sure to request a free sample of our material or visit our VALLONE® showroom. Do the washbasins and sinks already have holes for the faucet? 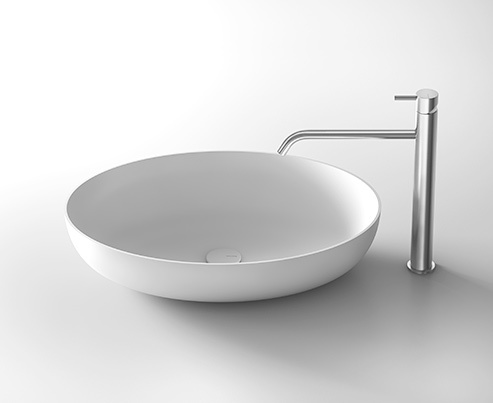 In order for you to always have the choice between a wall fitting, a free-standing or a regular fitting faucet, our washbasins and sinks are supplied without holes. Necessary holes can easily be drilled by you or the installer. We are happy to supply you with information on which tool to use. What do I have to keep in mind for the daily maintenance and cleaning? All VALLONE® products are very easy to maintain. Any detergent without acids may be used. For normal cleaning, the use of a damp cloth is usually sufficient (do not use a microfibre cloth). Any spills should be wiped off immediately with water (no warmer than 65 degrees), so the dirt can not sink in. This applies especially to hair coloring products. Tougher stains should be removed with a nonabrasive cleaning sponge in a circular motion and rinsed off the surface evenly and dried with a soft cloth. For extra shine of polished VELVET STONE™, you can use a simple polishing paste (car polish) from time to time. Can scratches and stains be removed again? Velvet Stone by VALLONE® is a very stable and durable material. Products with a matt finish are especially easy to maintain and clean. Any scratches and stains that can not be removed despite intensive cleaning, can be easily be worked out with a fine abrasive paper without damaging the material. For glossy surfaces handling scratches or stains is similar, but you may start with very fine, wet sandpaper (1000 -2000er grit), then polish with a gentle polishing paste (car polish). What to do in case of subsequent damage? Minor defects such as cracks caused by accident, you can easily repair with our free repair kit. The repair kit contains a special blend of mineral casting and fine sandpaper, with which you can create an invisible transition at the defected part. Major defects should generally be tended to by an expert. Do I need to pay special attention regarding the use of bath salts and bath oils? Basically there are no objections to the use of bath salts or oils. Since some bath salts and bath oils contain intensive colorings, you should rinse your sink or tub thoroughly after bathing. Is there a showroom where I can view the products? True to our motto “See it. Touch it. Take it. 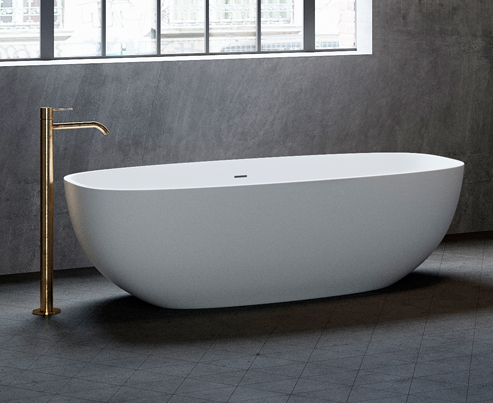 “, our clients have the opportunity to experience selected bath collections at our VALLONE® showroom, directly opposite the Design Zentrum NRW and the world famous Red Dot Design Museum at the UNESCO World Heritage Site Zollverein in Essen. Please set up an appointment and get a first hand look at our designs. How do I get an appointment at the VALLONE® showroom? The VALLONE® showroom is open exclusively for you on request. You can call +49201. 857 914 220, as well as e-mail us for an appointment for individual consultation. Even short-term appointments requests can easily be offered. What is the quickest way to the VALLONE® showroom? Our showroom is located directly on the grounds of the UNESCO World Heritage Site Zollverein. Please use our map to find us. How can I purchase products at VALLONE®? We have an online store with a shopping cart where you can order all VALLONE® products safely and conveniently from home. You also have the opportunity to place a personal order by telephone or in our showroom. Advance payment, PayPal and Credit card payment. All our online payment is secured by SSL-System. In the context of my bathroom planning how far in advance should I order a product? Our high quality VALLONE® products are handmade for you. Therefore, the delivery time might stretch to 8-10 weeks for some products. Many of our products are in stock and available for you immidiately. To learn about the respective delivery time for the desired products, please call us or send us an email. We will contact you shortly in return. Once you have received a confirmation from us and checked it, please pay the full amount of your merchandise by bank transfer, Paypal or credit card. Does VALLONE® offer a return for the products? You may return all ordered items within 14 days without any problem. The shipping costs are to be borne by the buyer. What is included with the order of a bathtub? All VALLONE® bathtubs come with integrated drain, integrated overflow protection and integrated push-open clasp (in chrome or mineral casting). What is included with the order of a sink? 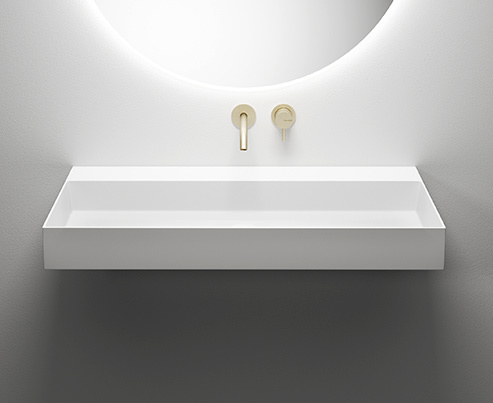 All sinks have integrated drains and push-open clasps. Due to construction details, the sinks do not have an overflow-protection. In addition, we offer optional siphons of our partner AVENARIUS. What is included with the order of a free standing sink? All free standing sinks have an integrated drain. Depending on the type of the washbasins, they are equipped with a push-open clasp and an integrated overflow protection. For more information about the installation, please refer to the respective detailed description. All VALLONE® products shipped in within Germany (mainland), are in insured, from an order value of 2.000, – EUR free shipping. Insured shipping of all our products are exclusively delt by through a leading logistics provider. For more information: Please check TERMS OF DELIVERY. Can products be delivered abroad? Upon request we offer worldwide shipping of our products to your desired destination. Depending on the country and distance, different shipping costs apply. We are happy to inform you about any costs and shipping time for abroad shipping. The processing and eventual payment of duty on import is dealt with professionally and reliably by our shipping partners. We are happy to assist in any way. What kind of packing does the order come with? We aim to ensure damage free delivery, so all products will be very carefully packed. All bathtubs are shipped in a sturdy box, resting on a large wooden pallet. Our sinks and washbasins come with a large box of thick-walled cardboard. Can I temporarily store a product with you? Before we entrust our shipping partner with the delivery, we will contact you again and clarify the final details of the shipment. If you would like to delay delivery due to a delay in construction, a later delivery, up to a period of four weeks is easily arranged and free of charge. For temporary storage beyond this period, we will find a suitable solution with you. Is it possible to choose a specific delivery date? Together with our shipping partner we ensure timely delivery at your requested delivery date. Usually you will get a call the day before the delivery to calculate a suitable and exact delivery time. Now you do not have to wait all day for the delivery. Is the bathtub delivered to the house? Due to insurance reasons, the merchandise can unfortunately only be delivered to the curb. Up to this point, the delivery is of course insured, and any transport-related damage is on us. If you have a walk-in garage or -storage space which may be accessible by a forklift, of course we will ensure to place your order there. Due to weight and size of the tubs, we strongly recommend you have at least four strong people to transport the package into the house. At times, narrow passageways or narrow doors are obstacles, requiring to place the bathtub in lateral position. Transportation belts as for piano transport can be useful. What happens in case of shipment damage? Once you have received the goods, you should check for completeness and obvious damage immediately. In the unlikely event of damage, have the driver give you a confirmation and inform us of the damage by telephone. We will try to provide you with a new tub without additional costs. Are there special requirements for installation due to the weight of the tub? 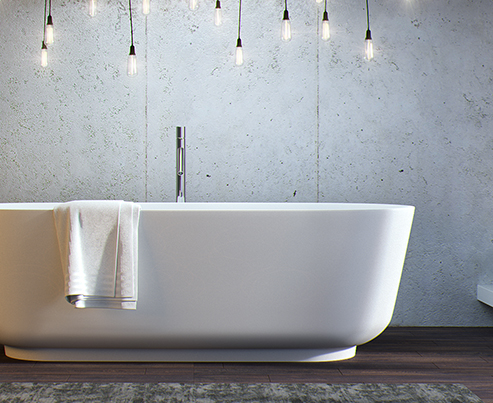 The load of a filled bath is no heavier than about 5 adults per square meter. From a structural point of view, this weight gain is perfectly fine in new buildings. Even in old buildings, there are basically no problems upon our experience. With the renovation of an old building (eg. with beamed ceilings), you should consult your architect or structural engineer. For transportation and installing the tub you should plan for three to four strong people as help. What are the concerns upon installation? In our download area you will find a detailed technical drawing for installation of every product. It provides you with all the necessary information. Should you have any further questions, please feel free to contact us. Each installation should be performed by a professional with knowledge of the legal sanitary requirements. Furthermore, only minimal construction tolerances of the ground on which the tub or sink is placed, are allowed, so as to ensure the stability of the bathtub. When installed on an unsuitable floor, your warranty will expire. Do I have to fasten a free standing tub to the floor? Due to the high weight, our free-standing Velvet Stone bathtubs are very stable. No further fastening with screws at all will be necessary. We do however recommend fixating the tub with silicone. Does a free standing tub require a special siphon? All free standing tubs by VALLONE® come with a special push-open clasp. For installation you need a customized siphon. We will help you to choose the correct siphon for your installation. Can I use regular fittings with all VALLONE® products? All our products can be combined with any fittings or faucets.